Alternative rockers Toad the Wet Sprocket make a strong comeback releasing latest album New Constellation on October 15th, breaking their 16 year hiatus. The interesting aspect was that the band turned to Kickstarter to finance the new album. ” With a goal to raise $50,000 through Kickstarter, the band members figured it would take a couple of months to raise the funds, but their fans surprised them by donating the entire amount in only 20 hours. ” as stated from an article on TheSpectrum.com. According to the bands official website, their quirky name came from a Monty Python comedy sketch and even though the band had success in the 90s selling platinum albums they ended up going their separate ways in 1998. Now that they are back together I couldn’t wait to listen to the new album and I’m impressed with the songs on New Constellation. The album is a good revival with a more upbeat vibe blended with their classic melodic style. So far I like the tracks: The Moment and Rare Bird which carry a more melancholy tone and I seem to always be attracted to those tracks first! The last track on the album is Enough, which is my current favorite and I think it is the most catchy ballad. 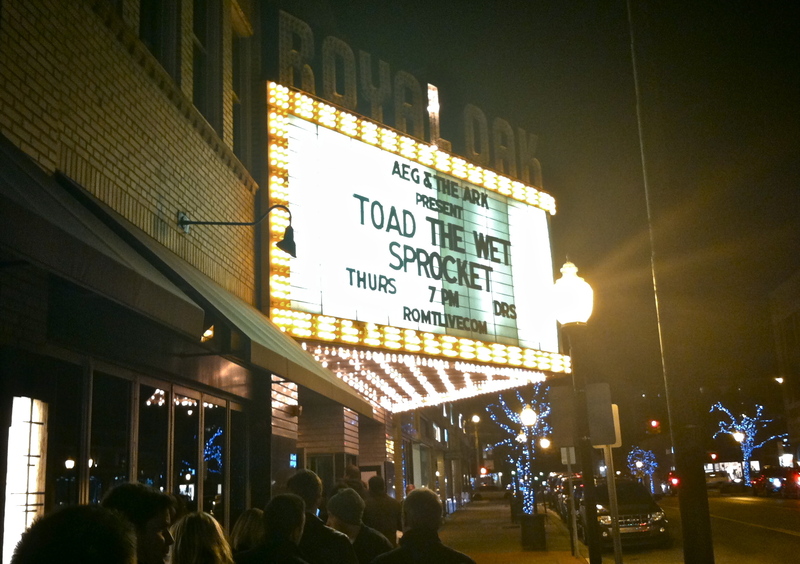 The band is currently on tour and performed in Detroit this past Thursday at the Royal Oak Music Theatre. I had been looking forward to going to this show because I was really into them in the 90s and I have the albums (1991) Fear and (1994) Dulcinea. I had a great time at the show and the mood was laid back and mostly acoustic. The band mixed up the set alternating between playing old and new songs. They even played tracks off Fear which put a big smile on my face. The encore included their big hits Fall Down and Walk on the Ocean. During my own conversations with people at the show, I would pick up bits of conversations between other fans who chatted about being in their 30s and reminisced about the grunge era. It was cool to hear that other fans felt the same way I did especially since this show has been a long-awaited reunion. Going back to reflect on the album Fear, I loved every single track especially: Walk on the Ocean, Hold Her Down and Butterflies. Fear is one of my top favorites in my music collection. I actually like it better than their follow-up album Dulcinea. Although that album has some gems with Fall Down and Something’s Always Wrong. In 1994 I watched the cult classic teen drama My So-Called Life and I remember Fall Down was played in one of the episodes. That song always makes me think of 1994 and of the show every time I hear it. I am happy that I could lend support to the band. I will gladly fork over my money to pay to download their music and to hear them perform live because they are worthy.